Sand, Sun & Saltwater: Exploring Mixed Media Landscape and More! 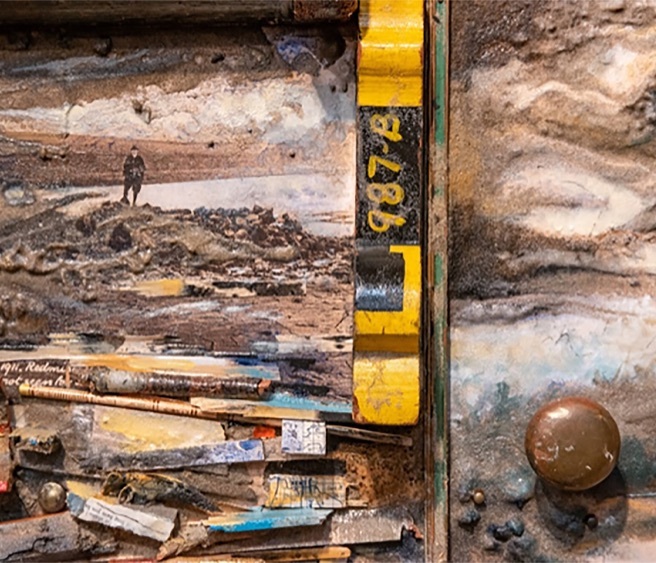 Dive into this extraordinary workshop exploring the vast Pacific Northwest landscape through the magic of mixed media collage. Over a four day/full day (9-4) workout, students will complete three or more large artworks on panels or canvases reflecting the raw, rugged coastal landscape. Using sand, mixed media, paint and found materials, students will develop surfaces that investigate a variety of perspectives on color and unconventional composition that will inform and enrich their own studio practices. Those new to mixed media are welcome to join returning sand painters and practiced surface builders for new and ever-expanding exploration and techniques. Long time Oregon painter, Judy Vogland, continues to work with water-based mixed media while incorporating natural and found materials as surface makers. She has taught surface building with sand on the Oregon beaches for nearly forty years. Students learn to create large paintings by working with beach sand and found materials manipulated by natural forces of gravity, wind and water. In addition to teaching at Portland State University, Cannon Beach Haystack School, Hillsboro High School and the Sitka Center, Vogland creates public space and corporate artwork and works in collage/assemblage for gallery exhibitions. *Please feel free to bring used equipment or share with others to reduce the cost. *Class starts at 9am, dress for weather, walking and beach time. unsized canvases ready to go. -30"x36", 24"x48", 30"x40", 12"x48", 12"x36", 36"x48"
better and as big as your transportation can manage for you. • Comfortable clothes, camera, swimsuit (? ), hat and sunscreen, towel or mat. • 1-quart Golden brand Polymer Medium Gloss...NOT gel, NOT glazing fluid. You will easily use up a quart. A pint is not enough. Maybe split a gallon with a student friend. Will keep for a long time. • Ebony pencil, snap off style razor knife. Any assorted scrap paper you have saved for something fun! check out Golden brand 1oz. for those hues. bring what you use and like! *IMPORTANT REMINDER- It pays to use higher quality materials as your finished work will hold up longer and reflect better color and consistency.